On the occasion of the 66th death anniversary of the first Prime Minister of Ceylon, D.S. Senanayake – the father of the nation, I wish to educate the present generation about this great and exemplary leader and his commitment to Buddhism. During 253 AD, a group of Buddhists, together with regional leaders, brought a sapling of the old Bo tree at Mahiyangana to be planted at the shrine of King Sri Sangabo at Attanagalla. At their last stop before reaching Attanagalla, they remained for the night resting at Botale. In the morning, they found that the sapling had taken root in the soil where they had left it. The Bo tree planted at Botale was the direct descendant of the tree at Mahiyangana - traditionally one of the places in Sri Lanka visited by the Lord Buddha. Botale is the village where D.S. Senanayake was born and brought up. This historic event itself shows that the ancestral roots of this great leader were tied with Buddhism with a unique, un-detachable link to the strong followers of the Buddhist path. D.S. followed the footsteps of his elder brother F.R., who was a religious and anti-temperance leader. D.S. also had the habit of worshiping his mother before leaving home for any kind of activity. That was the tradition of all children of Buddhist families in Ceylon. Ceylon became a British colony in 1815, under the treaty signed with hill country leaders. However, conditions of the treaty were broken by the British arbitrarily and Buddhism, which was to be protected and nurtured under the government, was virtually neglected. As a patriot and faithful Buddhist, D.S. wanted to get the government to restore the dignity of Buddhism. He worked very hard to get that realized during his time as the first Prime Minister of Ceylon. He always followed the path of Lord Buddha and practised the Buddhist principle of equal treatment of all. The gaining of independence is also a result of a compassionate mind, refusing to hate one’s enemies. That was the thinking of D.S. in his struggle against the British. D.S. spearheaded the independence struggle of the then Ceylon. He followed the Buddhist way of achieving victory. He and his eminent team, consisting of an elder brother F.R. Senanayake and colleagues, namely, Sir D.B. Jayatilaka, Sir Ponnambalam Ramanathan, Sir Ponnambalam Arunachalam, T.B. Jayah, E.W. Perera and many others, were the stalwarts of the Independence Movement. This intellectual group with its coherent plan was able to win independence for our motherland without shedding a drop of blood. In considering the way of Lord Buddha, he followed the Lichchavi concept when the United National Party was formed, bringing various political and social organizations, such as Sri Lanka Jathika Sangamaya, Sinhala Maha Sabha, and the Muslim League, under one umbrella, and gave guidance to the freedom struggle with new vigour and foresight. In this manner, he appreciated the use of a strategy of collective compromise and consensus in taking decisions to resolve problems. 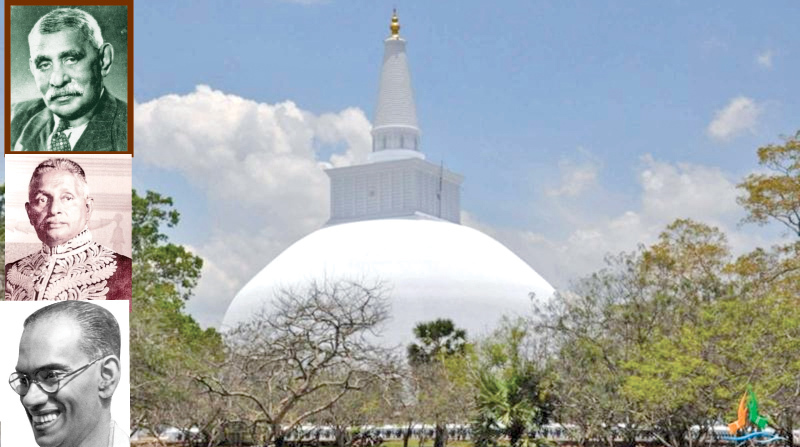 He also took steps to restore many ancient shrines and gave special attention to the planned development of sacred Ruwanweliseya, being a member of the Chaitya Restoration Committee - Anuradhapura. 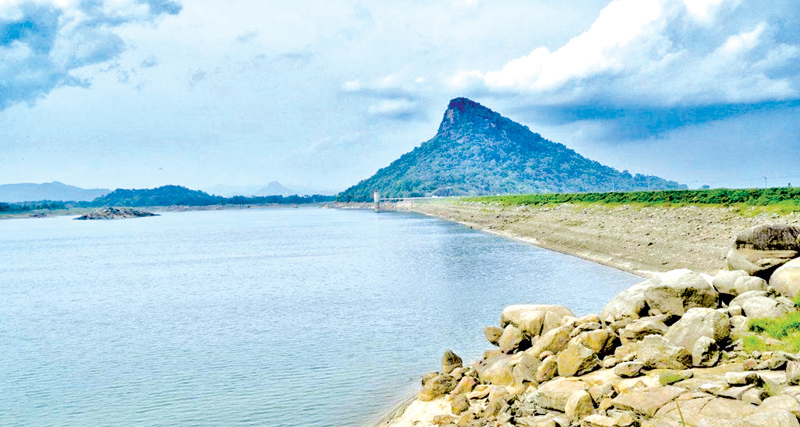 He pioneered the restoration of ancient historic monuments in Polonnaruwa. He was president of the Mahiyangana Restoration Society to rehabilitate the Mahiyangana chaitya. Due to the commencement of renovation of the Mahiyangana stupa, most of the other city development components were also taking place. He was also concerned about the religious reawakening in the South of Ceylon. Accordingly, he initiated restoration activities of the Kataragama Kiriwehera. It was finally ceremonially offered over to the Maha Sangha by his son, Prime Minister Dudley Senanayake. The Salgala forest monastery was also established by D.S., who donated most of his ancestral lands to the Buddha Sasana and oversaw the development process. In searching for information about D.S. and his religious activities, we noted that there are many instances where D.S. Senanayake attended religious ceremonies in various temples around the country. I had the opportunity to discuss those religious activities with Chief Incumbent of Kotahena Sri Paranananda temple, Most Ven. Thambavita Wimalawansha Thera. There was a paper cutting dated February 29, 1927, from the Sinhala Baudhaya, reporting that D.S. Senanayake was the chief guest at the ceremony to lay the foundation for Bo Maluwa – shrine for the Bo tree – along with the Chief Priests (Mahanayaka Theras) of both the Malwatta and Asgiriya Chapters and Mallika Hewawitharana, mother of Ven. Anagarika Dharmapala. When Dudley was born on June 19, 1911, D.S. and his father, Mudaliyar Don Spater Senanayake, were at the Botale temple, to ceremonially offer 25 acres of land owned by them to the temple and to the Maha Sangha. This shows how generously and lavishly they donated their assets to the Buddha Sasana. As soon as D.S. was sworn in as first Prime Minister of Ceylon, he went to Kollupitiya Polwatte temple and worshiped the Buddha by offering flowers and got the blessings of the Maha Sangha. Later in commemoration of this historical event, D.S. planted a mango tree within the premises of the temple. On that occasion, he emphasised that the government of Ceylon needs to give Buddhism the foremost place, and accordingly it is the duty of the state to protect and foster the Buddha Sasana, while assuring to all the freedom to practise their religion. D.S. Senanayake was invited to participate at the San Francisco world leaders’ conference in September 1951 after the Second World War to propose punitive provisions and to enforce arbitrary restrictions and embargos on Japan. At that time D.S. was not in a position to attend that meeting and proposed to send J.R. Jayewardene as the representative of Ceylon. As a Buddhist, he was a great lover of animals and the environment. By establishing farms and encouraging cattle rearing, he sought to educate the rural folk in methods of housing, breeding and feeding livestock. Also he set up the Ruhuna and Wilpattu National Parks by legislation introduced in 1938, prohibiting the killing of park animals. D.S. Senanayake was instrumental in celebrating Buddha Jayanthiya to commemorate 2,500 years of Enlightenment of Lord Buddha. He inaugurated the first meeting with the Maha Sangha, and after his sudden demise, Sir John Kotelawala continued his vision towards achieving his endeavours. Later it was celebrated by S.W.R.D. Bandaranaike. The initial activities of the printing of the Thripitaka was the priority of D.S. Senanayake. Subsequently, Prime Minister Sir John Kotelawala gave his fullest cooperation towards this meritorious deed and it became a reality. D.S. wanted to revive the ancient kings’ concept of the tank, dagaba, village and temple (wewai, dagebai, gamai, pansalai) after it was neglected for so many centuries. This concept was given priority by D.S. when he was developing new settlements along with irrigation and agriculture systems in the Eastern and Northern areas of Ceylon. As a genuine Buddhist and patriot, D.S rendered yeomen service to the religion and nation with dedication and honesty and made an extraordinary contribution to this country as a whole. Without any kind of division, each and every person who belongs to this independent motherland - Sri Lanka - should pay their utmost respect to this great leader, demonstrating their gratitude.